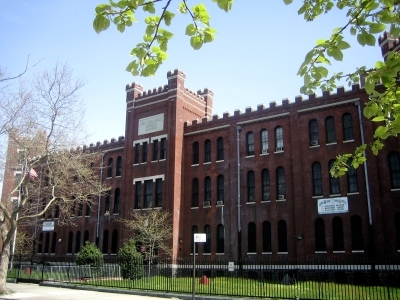 The Union Grounds, formally known as the Union Base Ball and Cricket Grounds, were run by William Cammeyer, who was proprietor of a skating pond in the Williamsburgh area, bounded by Harrison Avenue, Rutledge Street, Lynch Street, and Marcy Avenue. Cammeyer, reputedly after a conversation with Henry Chadwick on how to make profit from his land over more than two months, set out to convert the grounds for baseball for the summer of 1862, and performed a fine job with some speed. Seating was available for around 1,500 spectators, but many more could be accommodated around the extremely large field without being likely to interfere with play. An important aspect of the arrangement was to "provide a suitable place for ball playing, where ladies can witness the game without being annoyed by the rowdies who attend some of the first-class matches." Rather than charge the home teams rent, Cammeyer decided on a new idea: charging spectators for admission. The original fee was 10 cents. The field is reputed to be the first enclosed baseball park, although this has not been definitely established. Cammeyer advertised that "none but first class clubs need apply" as tenants for the Union Grounds, and signed up the Eckford, Putnam, and Constellation Clubs. Picked nines of players from the three tenant clubs played the first match at the grounds on May 15, 1862. Manolt's Side defeated McKinstry's Side, 17 to 15. McKinstry and Spencer, both of the Putnam club, won a bat and a ball from Cammeyer as reward for scoring the most runs for their teams. In addition, a band provided music for the spectators throughout proceedings. An estimated 3,000 visitors helped the Union Grounds to an auspicious beginning. Aside from its early status as an enclosed field, the Union Grounds had one other highly unusual feature: a pagoda was in play in deep center field. This structure was three storeys high, and during skating season it would be filled with lamps each evening to decorate the pond with glittering reflections. 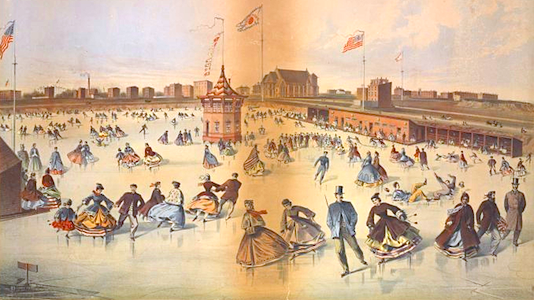 Although the site remained in operation as a rink during winter, the Brooklyn Eagle reported in 1863 that the pagoda was scheduled to be removed. It ended up lasting as long as the grounds themselves, however. The Union Grounds saw many fine matches in its time. One big game in 1862 saw the combined clubs of Brooklyn's eastern district defeat a Philadelphia nine, 23 to 16. Match reports focused almost as much attention on the fine collation of foods available after the game as on the play itself. In a classic best of three matchup that same year, the Eckford Club wrested the championship from the long-reigning Atlantics. Attendance at the third and deciding match filled the grounds completely, and spectators even crowded onto embankments outside with a view of the game, seeing a tense 8 to 3 victory for the Eckford Club. The Eckfords also sustained one of their worst defeats at the Union Grounds- a 55 to 11 thrashing at the hands of the Atlantic Club in 1868. We notice that the admission fee of 25 cents now charged for first class matches on inclosed grounds is not relished by the masses. By the respectable portion of the community, however, it is regarded as a desirable improvement, as by means of the increased price charged for admission hundreds of blackguard boys are kept out of the grounds, while the reputable portion of the patrons of the game are afforded better opportunities for enjoying a contest. The character of the crowd kept off the Union Grounds by the increased charge from 10 to 25 cents may be judged by the blasphemy and obscenity of the language used by the hooting assemblage which congregates on the outside and peeps through the fence holes at the players. It is these roughs who have been at the bottom of disturbances at match games on free grounds and who have formed a large portion of the gatherings at the 10 cent charges on inclosed grounds, and we are glad to see the increased tariff has had the effect of keeping them out of the inclosed ball grounds. We have seen many a fine display of ball playing in our time, but never one to surpass that of the game of Saturday. It is questionable whether a single man present on the occasion would have hesitated to have paid a dollar admission, could he have been assured of witnessing such a beautiful display of base ball playing as was made by the contesting nines in this game. Beyond doubt it was the best played, most closely contested and exciting game of ball ever played on the Union Grounds, and moreover, a display of skill and at the hands of thoroughly trained and disciplined nines, which presented a striking contrast to the crude and unfinished style of play peculiar to our local professional nines, an illustration of which was given on Thursday last on the occasion of the Mutual and Haymaker match. For the record, the Olympic nine scored three runs in the eighth inning and two in the ninth to cap a fine rally with a 6 to 5 victory. 3,000 were willing to pay 50 cents to witness the event. The Union Grounds also saw the occasional sham. In September, 1872, the Brooklyn Eagle complained of "gate money nines" which would represent themselves as better than they really were, in order to share gate receipts of an anticipated big game. In particular, the complaint was made of a nine from Troy, who claimed to be made up of the best of the old Haymaker and Putnam Clubs of that city, but actually had one Putnam and no Haymakers at all. This club was soundly thrashed, 37 to 5, by the Mutual Club at the Union Grounds. The Eckford Club remained at the Union Grounds for the remainder of its history as a major base ball club, through its ill fated National Association season of 1872. Several other major clubs called the Union Grounds home at times, too. The Atlantic Club played there as a National Association entrant from 1873 to 1875, as did Atlantic namesake clubs through 1882. The Mutual Club of New York moved from Hoboken to the Union Grounds in 1868, a move applauded in the Eagle: There is something in the air "me boys," in Brooklyn that makes ball players. Look at the Mutuals, see how they have improved since they came to Brooklyn. The Mutual Club remained until it folded at the end of the 1876 National League season. 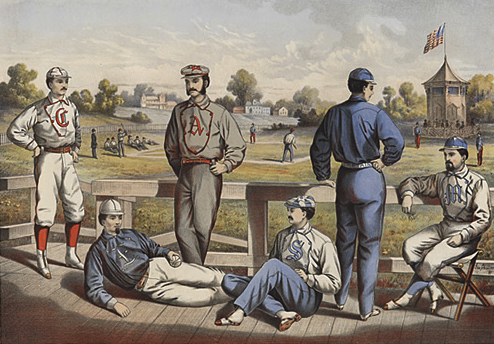 Finally, the National League's Dark Blues of Hartford moved to Brooklyn and called the Union Grounds home in 1877. The last major league game at the Union Grounds was played between the Providence Grays and Milwaukee Cream Citys of the National League, on July 26, 1878. Providence won a well played game 4 to 1. The match was an experimental one, to see if the baseball starved patrons of Brooklyn would turn out to see a neutral affair, as they had with such enthusiasm seven years earlier. They did not, and each club took home just $60 in receipts. 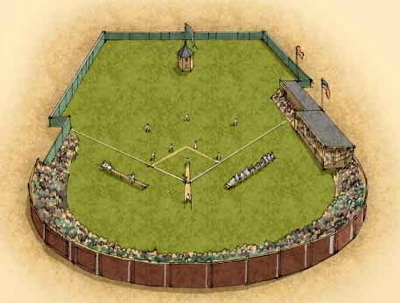 The Union Grounds remained in use after major league baseball left, hosting amateur teams and occasional challenge games. Late in the 1870s, the Alaska, Montgomery, and Flyaway Clubs, all amateur concerns, played home games at the old park. In 1880, the Rochesters defeated the Nationals of Washington in a challenge match at the Union Grounds, but turned down the prize of a set of silver, "because the Nationals, owing to Lynch being disabled, were unable to present their full strength." The Rochesters did not go away empty handed, since "they took it out in lager instead." The Nationals took the series, though, winning the final game 3 to 2 in 11 innings before taking the long trip home. Between those games, a series of exhibitions was also played between the same Rochester team, commonly known as the Hop Bitters, and the Union nine, picked from local clubs in Brooklyn. So successful and friendly was the competition that by 1881, a team composed of players from these matches had formed as the Metropolitans, later to be New York's entry in the American Association. What are the Atlantics going to do for grounds next season? The Union grounds if used will require a new fence and new stands. The fence now standing is rotting away fast, and there will not be much left of it by the Spring. It would cost as much to fit up that field again as to fence in a new ground. A field on the Jockey Club grounds at Sheepshead Bay would pay well during June, July, and August. That said, the field somehow struggled through the 1882 season. The last game of any kind at the Union Grounds that we can find reference to is between the New York and Boston Paper Trade nines, on September 16, 1882. The Union Grounds were demolished in July 1883, with half of the site making room for the 47th Regiment armory, which still stands today. 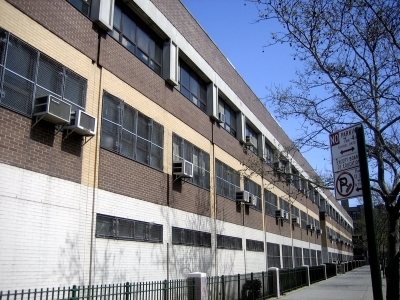 The remainder of the site is now a school.